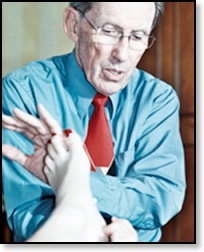 On the 1st August 2009, the St. Petersburg Times ran a comprehensive article about Dwight C Byers and his work in Reflexology. Byers, who founded the International Institute of Reflexology in St. Petersburg in 1976, is a longtime practitioner of reflexology, a hands-on therapy that entails applying pressure to particular areas on a patient’s hands and feet. Properly applied, Byers says, that pressure can improve circulation, alleviate pain and reduce tension. Dwight Byers has dedicated his life to healing people by reading their feet. 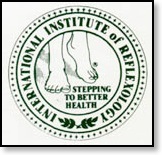 Byers, who founded the International Institute of Reflexology in St. Petersburg in 1976, is a longtime practitioner of reflexology, a hands-on therapy that entails applying pressure to particular areas on a patient's hands and feet. "Our feet are our foundation," Byers said, "yet most people abuse or neglect them." According to practitioners of this therapy, reflex areas in hands and feet correspond to all the glands and organs of the body. "Those reflexes are a mirror image of our body," Byers said. "The areas that are tender are the ones you need to work on the most." One recent morning Byers' fingers worked a patient's foot swiftly and adeptly. His thumb and fingers moved in a circular motion, applying careful pressure. "How you hold the foot is important," Byers said as he worked. "When something is painful you have to back off a little and come back to it." He works hands and feet for different purposes. "The feet are more therapeutic," he said, "and the hands are more relaxing." Hands, he added, are treated differently because of their constant use. "You have to get in there with pinpoint pressure," he said. Gaining favor, Reflexology, which dates to the third century B.C. in Egypt, has been used to treat many conditions. Byers said it can help control diabetes, decrease the frequency of nighttime trips to the bathroom by men with enlarged prostates, and reduce the side effects of chemotherapy. As with other alternative therapies, reflexology is slowly gaining favor with the medical community as more studies are done. In the United States, most focus on cancer patients undergoing chemotherapy. The National Institutes of Health recently funded one such study at the Michigan State University College of Nursing. In a pilot study, researchers tested three different complementary therapies on these patients — reflexology, guided imagery and reminiscence therapy. Reflexology had the most positive outcomes, reported Gwen Wyatt, professor at the nursing college. "We see things like a decrease in depression and anxiety, and improvements in spirituality and emotional life,'' she said. In 2000 a similar study was conducted at the School of Nursing at East Carolina University. Most women in a group of 23 breast cancer patients reported less anxiety after one 30-minute session of reflexology. One in three had significantly diminished pain as well. Raised on reflexology, Byers, now 80, began learning to "read" feet at age 16 from his aunt, Eunice Ingham, a pioneer in the field. In 1938 Ingham published her book, Stories the Feet Can Tell Through Reflexology, almost a bible to her followers. Byers' daughter Gail and grandson James are certified practitioners. His wife, Nancy, is the business manager. James Pedersen, 28, also began learning reflexology when he was 16. "I've been raised with reflexology," he said. "My grandfather played with my feet when I was born." Pedersen has been treating Lydia Uribe, 80, for a year-and-a-half. She had multiple spinal surgeries and painful legs, impeding motion. "This relaxes me," Uribe recently said of the treatment. "I have much more movement now." She kicked each leg and bent over to touch the ground, her legs straight. "See?" she said, "I can bend more easily now." The success rate for any ailment, though, is still largely anecdotal, based on the word of patients. Treatments generally cost $30 per half-hour. Byers offers seniors a discount for hour long sessions. Reflexology, Byers said, shouldn't be painful, but the practitioner can't be timid either. "You have to exert authority," he said. "This is not just a foot massage." For information, call (727) 343-4811. Want to train as a Reflexologist? Reflexology, IIR, AOR, FFR Cert, International Institute of Reflexology, Association of Reflexologists, VRT, Vertical Reflexology in Dronfield, Finger Free Reflexology, holistic therapies, complementary therapies, alternative health, relaxation, wellbeing, health, peace, calm, wellness, stress reduction, spiritual development, personal development, in Sheffield, Bradway, Dore, Totley, Nether Edge, Ecclesall, Norton, Meersbrook, Crookes, Walkley, South Yorkshire, Dronfield, Holmesfield, Coal Aston, Eckington, Derbyshire, Chesterfield, Brimington, Hasland, Newbold, East Midlands, Peak District, Hope Valley, Hathersage. There is a world of difference between someone offering 'foot massage' and a highly trained and skilled Reflexologist who undertakes annual CPD training (Continuing Professional Developm sent).